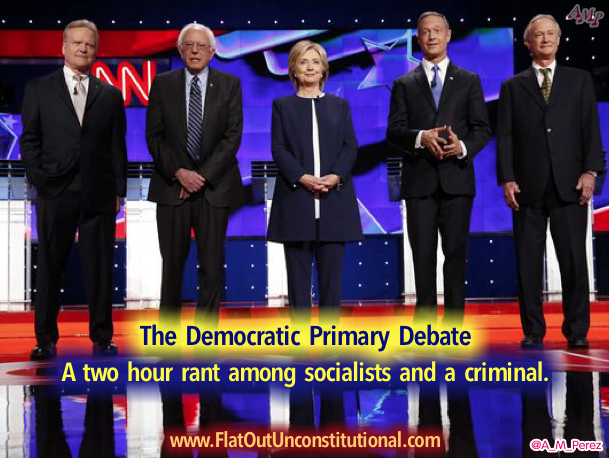 The Democrat Debate: I watched it, so you don’t have to! Trying to encapsulate the Democratic Primary Debate is one of the hardest things I have ever tried to do. First of all, I wasn’t in the least bit interested. Second, it was a nonstop socialist manifesto coming from 5 sides. Third, Hillary’s voice gives me a headache! I am going to give you just the highlights, because much of the debate was repetitive, especially with Bernie Sanders. It was one liberal talking point after another in an obvious attempt to buy votes from deadbeats and illegal aliens alike. Introductions started with Lincoln Chafee who must not even know where he stands. He started his intro bragging about keeping taxes low as mayor and never skipped a beat as he went right into how he voted against the Bush tax cuts as Senator. Jim Webb just went full progressive in his intro. He started attacking the financial sector (capitalism) and then claimed that he fought for economic fairness and social justice from day one in the Senate. Martin O’Malley started off bragging about raising the minimum wage. A great way to destroy any economy with increased inflation and unemployment. Then he claimed he passed marriage equality and voted for the Dream Act, so we know he’s anti-Christian, anti-American, and pro-Amnesty. He went on to claim he passed comprehensive gun legislation, about as unconstitutional as legislation can get at any level of government. He thanked Obama for bringing our country a long way, since the Wall Street crash of 2008, and then said that college should be a debt free option, in other words, we all have to pay for deadbeats to go to college. Bernie Sanders started his intro as an Occupy Wall Streeter, complaining about the income that goes to the top 1%. Then he started whining about the Citizens United Supreme Court decision on campaign finance. He quickly switched gears and said that the scientific community is virtually unanimous and that climate change being caused by human activity is real. I guess he doesn’t know that science isn’t up for a vote. When he started complaining about black youth unemployment being 51% and hispanic youth unemployment being 36%, he failed to bring up the fact that this is all in cities and states that have been run by democrats for decades and that his state of Vermont has hardly any of either. His solution is to dump taxpayer money into education and jobs. I’m not sure how taxpayer money buys jobs. Hillary Clinton started rambling on about next to nothing. She traveled the country and listened. She put forth specific plans on creating jobs, investing in infrastructure and clean energy. She claimed that we can take the opportunity imposed by climate change to grow our economy. I suppose that means bailing out companies like Solyndra and raising taxes on energy, so we can’t afford it. She said we need to raise wages by raising the minimum wage and so much more, such as finding ways to force companies to share their profits with workers. Then we have to figure out how to make the tax system fair, because the wealthy pay too little. She says this even though welfare deadbeats pay zero. During the entire debate she would say we have to find ways to do this, or figure out that. I thought she said she had specific plans. Starting off with questions for the candidates, Anderson Cooper rattled off a laundry list of things Hillary has switched her position on and asked if she will say anything just to be elected. Her answer was that she has always been consistent. First lie of the night, point blank and blatant. Then when cooper showed two separate instances where she claimed that no one was more progressive than her in the one instance and then that she was a moderate centrist in the next instance, he asked if she changes her political identity depending on who she is talking to. Her answer was that she has a range of views. Cooper’s next question was to Bernie Sanders asking him how any democratic socialist could win the general election. Sanders just rambled on about the top 1% and how every other country has free healthcare as a right. He said we need to look to other countries for our solutions for healthcare and paid family vacation. In other words, we have to find out what other countries, where people live in shoe boxes, have accomplished for their working people and copy that. Sanders failed to answer Cooper’s question. Cooper asked him if he was a capitalist. Sanders started going on about the top 1% again and supporting small and medium businesses while Clinton broke in to say that sometimes we have to save capitalism from itself. In other words, blah, blah, blah, say something without saying anything. Anderson Cooper moved on to Lincoln Chafee to ask why he keeps changing positions, starting off as a republican, then becoming an independent and now a democrat. Chafee’s answer was that he is a block of granite on the issues and was always a liberal. Cooper’s question for O’Malley was about his record as mayor of Baltimore and his zero tolerance policy and how that could have lead to the unrest in Baltimore now. O’Malley floundered almost incoherently about how he put Balitmore on a path to reduce crime and then he talked about how bad it was and how he had to attend a funeral for a family who were fire bombed in their sleep for calling the police on drug dealers. I’m not sure how O’Malley thinks these things help him out. Then he claimed that they saved lives during his time as mayor and he gave Baltimore a better future, improving police/civilian relations. Cooper brought up the fact that in one year alone, they had 100,000 arrests in the city of 640,000 people, so Baltimore was sued and had to settle. O’Malley said that after that arrests declined, because it was peaceful, so you could actually walk without being victims of violent crime. Wow! Just Wow! Webb was asked about his stance against affirmative action and whether it makes him out of step with the democratic party which is less than half white. Webb stated that he always supported affirmative action, but only for blacks. Anderson Cooper went on to the subject of guns, bringing up the Oregon Shooting at Umpqua Community College. Bernie Sanders started a tirade against assault weapons and claiming he had a D- rating from the NRA. Clinton outright lied and said we lose 90 people per day due to gun violence and that we have to go against the NRA. Then she claimed that a majority of gun owners support unconstitutional background checks. O’Malley started bragging about having passed comprehensive gun control legislation & that he can do the same as president. Webb tried to pretend he was on both sides of the issue, saying we have to figure out who shouldn’t have guns, so we need background checks, but other people should be able to protect themselves, because they don’t have bodyguards like high level politicians in Washington. Chafee, who has an F rating with the NRA kept repeating “common sense gun safety legislation,” and whining about how the gun lobby always steps in to stop such legislation, claiming they’re trying to take your guns. Stop trying to take our guns then, Chafee! Cooper moved quickly onto the topic of Russia in Syria and asked Hillary, who “spear headed the ‘reset’ with Russia,” how she would deal with Putin. She blamed Putin for becoming president again, because they were able to deal with Medvedev much easier, so now we have to stand up to Putin. She gave no real answer other than we have to take a leadership position and tell Putin he can’t be causing more problems in Syria. Sanders’ gave his opinion, the only point being that it’s a quagmire and the U.S. can’t get involved in another quagmire. Dana Bash had a question for Chafee, having been the only Republican to vote against the war in Iraq, while Hillary voted for it. She has since regretted that. Remember, Hillary said she has always been consistent! Dana’s question to Chafee was why Clinton’s flip flop isn’t good enough for him, since she now says she shouldn’t have voted for the war in Iraq. Chafee went on and on about how it was the worst decision in American history, we just came out of the Vietnam era, and quagmires, blah, blah and how Hillary’s performance in the past is an indication of how she would perform in the future. Hillary jumped in to explain that she was Secretary of State and worked with Obama in the situation room and we need to put together a coalition. She basically said nothing of substance. The democrat candidates bickered on and on for a while about using military force, never really departing from the normal democrat talking points on the issue until Anderson Cooper finally brought up Benghazi with a softball question for Clinton. Cooper brought up the fact that Webb had said that the attack in Benghazi was inevitable, so shouldn’t Hillary have seen it coming? With a huge grin on her face, she said, “Let’s remember what was going on.” She went on to say that Europe and our Arab friends were asking to help depose Khadafi, because he was threatening to kill a lot of people, and her response to them was that we would not help lead that, but would only provide essential, unique capabilities that we have, but the Europeans and Arabs had to be first over the line. If that was confusing, blame Hillar, not me. She said that President Obama made the right decision at the time and the Libyan people had a free election for the first time since 1951. In other words, she never answered the question and floundered around yammering on about other things. Good enough for Anderson Cooper, because he moved on to O’Malley whose answer about Benghazi was that there were lessons to be learned about it, that we need to do a much better job as a nation. Another non-answer. The debate quickly broke into a bunch of left wing talking points coming from the candidates with really no room for any of them to disagree with one another. Global warming, fossil fuels, and how we can’t put American boots on any grounds. Cooper brought up that Clinton will have to testify in front of Congress next week because of her e-mail scandal and asked Clinton how she is going to handle anything challenging as President after her fumbling around with this issue and not getting it under control? Hillary said that she did take responsibility for it and did say it was a mistake, but it was allowed by the State Department. So now she has been as transparent as she knows how to be. She said she has been asking to testify all along. A blatant lie. Then she blamed the congressional committee that she has to testify to, of being an arm of the republican party that is out to get her. She switched to asking how are we going to make college affordable, how are we going to pay down student debt, how are we going to get health care for everybody? She went completely off the rails. She said she didn’t want to talk about her e-mails, but wanted to talk about what the people want from the next president! Bernie Sanders chimed in to say that Hillary is right and that the American people are sick and tired of hearing about her **** e-mails! The sheep in the crowd roared. Hillary stood next to Bernie yucking it up, laughing and laughing. Bernie went off onto another socialist rant about the middle class losing to corporate America. The crowd of sheep went ballistic. They got a live, call in, video question from someone named Sterling Arthur Wilkins, a black guy from Des Moines Iowa. His question was, “Do black lives matter or do all lives matter? Sanders answered, “Black Lives Matter.” Then he went on to pander about all the innocent blacks who die every day at the hands of cops. He ranted on about the criminal justice system and how we need more jobs and less jail cells. O’Malley said that the Black Lives Matter point is legitimate and serious. Remember, this was the mayor of Baltimore. He also said we have to fix the justice system and address race relations. Clinton answered by saying that Obama has been a great leader on these issues, but never answered the question. Then she claimed that this is a bipartisan issue and that we have to do more about the lives of these children. We need to be committed to making it possible for kids to live to their potential. We need schools, we need housing, we need a new, new deal. A complete rant. The topic went into a long and boring tirade about how evil bankers and Wall Street are. Then back to climate change and Clinton flip flopping on the Keystone Pipeline. But I thought Clinton was always consistent? They went on and on about income inequality and how we need to give more and more entitlements. They finally moved on to comprehensive immigration reform where their arguments amounted to little more than who could give more to illegals. Webb said he wouldn’t have a problem with giving illegals Obamacare. It became a competition about who could pander to illegals the most, all under the guise of the American Dream. Clinton said that illegals should get in-state tuition. O’Malley bragged that he already did that in Maryland. The Patriot Act was brought up and Sanders was the only one on the stage who voted against the Patriot Act and says that he would shut down the NSA surveillance program. Wow! Bernie Sanders gets one point! Then he went on about the evils of the power of corporate America again. They got another question from a caller named Anna Bettis, from Tempe, Arizona. She said that as a young person, she is concerned with climate change and wanted to know what the candidates would do to address it as president. Oh, cry me a river. Anna Bettis was obviously a stereotypical, liberal brain washee. I’ll spare you the answers. You know them already. This debate kept going in circles. They came back to the subject of paid family leave and went on and on about how to give more of our money to deadbeats and women who make it their choice to have kids and feel that we should pay for them to stay home with the children. Side note: my mom found a way to stay home with the kids. She quit her job. Then she started babysitting and made more money than she did when working. When the subject of medical marijuana came up, Bernie Sanders didn’t miss the chance to bring up how many people are in jail for smoking marijuana and how CEOs on Wall Street walk away. Clinton wouldn’t take a position on it, but rambled on for quite a while saying nothing. I grabbed the Excedrin. The final question was to all the candidates. Anderson Cooper asked which enemy in their political careers they are most proud of. Chafee said the Coal Lobby, because of his working hard against climate change. O’Malley said, the National Rifle Association. Clinton then said, in addition to the NRA, the health insurance companies, the drug companies, the Iranians and the Republicans. Sanders lumped Wall Street and the pharmaceutical industry at the top of his list. Webb said the enemy soldier who threw the grenade who wounded him, but he’s not around right now to talk to. Closing Statements were much of the same. Chafee wants to end wars, address climate change, income inequality, and help blacks among a long list of other things he rattled off. Webb said we have to to work through complex issues. We need a political strategy for our economy and foreign policy. He wants social justice, and knows how to lead. O’Malley was grateful to be here. He said you heard a different debate tonight than the republican debate. No one denigrated women or made racist comments. What we heard was an honest search for answers to move forward and he went on with a list of more of the same liberal talking points. I thought these people were supposed to have answers, not be searching for them during the debate. Sanders blamed America for having the highest rate of child poverty of any major country in the world and more wealth and income inequality than any country! He said that we shouldn’t be the only country that doesn’t provide a right to free medical care and free family leave from work. Basically he wants everything to be free for everyone! Clinton just grated on me with her screeching voice. She said that in this debate we tried to deal with the tough issues facing our country, in stark contrast to republicans. She claimed that she has a proven track record of getting things done. I’m not sure where you can find this track record, because Google doesn’t have it. Watching this debate and writing this has been an excruciating endeavor. I feel that there are probably plenty of people out there like me who want to know what crack pot things were said, but didn’t want to stomach sitting through two hours of socialist dogma, so I hope that the pains I went through to give a brief synopsis can help some interested people save valuable time. I’m not sure I can ever sit through another Democratic Primary debate. My head is pounding. Previous I Don’t Have Enough Faith to be an Atheist! Next The 2nd Amendment: Shall Not Be Infringed! That is the most “stupid” I have ever seen in one place. Your lack of economic understanding, along with pretty much every other idea in existence, would be comical, were it not for the fact that those are real, human lives affected by your crass idiocy, and the policies you promote, and the ones you denigrate. I hope that you are at least very, very wealthy… so it least your motives can be written off as merely selfish. Because the alternative is that you have a deep loathing of all humanity, and wish to make everyone else as miserable as you must be, with your putrid, rotting soul. You want other people to be your slaves and actually work to support you and you have the nerve to call me selfish? Who is the more greedy, the person who wants to keep what they earned or the person who wants to steal what someone else earned, you greeeeeeeedy, pathetic, thief? Thanks for the update I really had a headache and it would have intensified if I had to go through all the same rehtrotic not to mention the moderator(Cooper). Absolutely my pleasure! Oh wait, that’s a lie. 🙂 Well, I figured it had to be done! I don’t know if I could ever suffer through another one unless they shorten it to half an hour. How many times do they need to blame guns and corporations to get their point across to liberal sheep anyway?